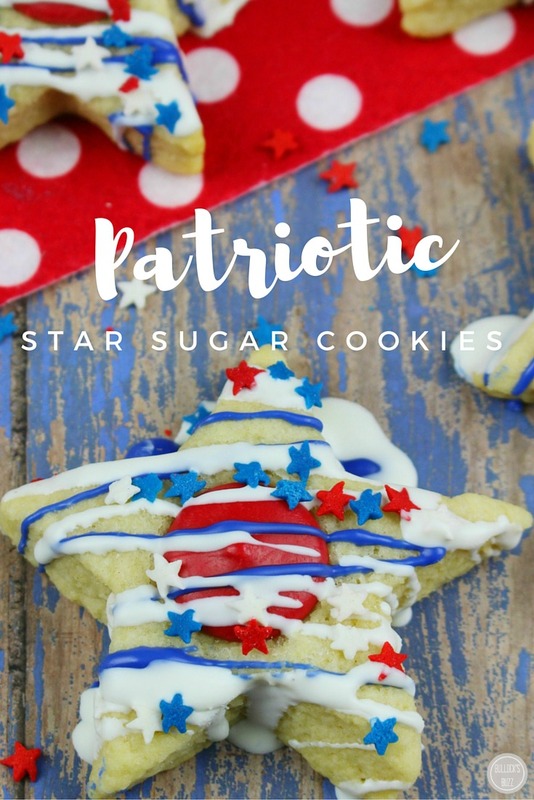 Patriotic Star Sugar Cookies: Memorial Day and Fourth of July Cookie Recipe! Red, White and Blue Patriotic Star Sugar Cookies are perfect for Memorial Day, the 4th of July and more! I absolutely adore recipes that look super festive and are oh-so fun to make! This particular cookie recipe is simple to make and can be used for any holiday or special occasion. Simply change out the cookie cutter shape and the colors! Black cats and orange pumpkins for Halloween, red and green stars for Christmas, blue and white dreidles for Hanukkah – you get the idea! Ready to see how to make these delicious Patriotic Star Sugar Cookies? Keep in mind that this recipe will yield 1 1/2 dozen patriotic star sugar cookies. 2. Add the eggs and butter to a medium mixing bowl. Whisk to blend well. 3. In a large mixing bowl, add the flour, sugar and baking powder. Stir until mixed. 4. Add the vanilla and stir well. Pour into the bowl with the dry ingredients. Blend until fully incorporated. 5. Roll the dough out on a floured surface. You can make the cookies as thick or as thin as you want. 6. Using a star cookie cutter, cut out 18 star shapes and place them on the cookie sheets. Sprinkle white sanding sugar crystals (optional) on top of each cookie. 7. Bake for 10-12 minutes. Do not let the cookies brown. 8. Cool on the cookie sheets for 5 minutes and then transfer to wire racks to finish cooling. 9. While still warm, place a red chocolate melt in the middle of each cookie. 10. In a small microwave safe bowl, melt the blue chocolate candies for 45 seconds. Stir until melted. (Depending on your microwave, you may have to microwave in 8 second additional intervals until melted). 11. With a spoon, lightly drizzle the melted blue chocolate on top of each cookie. 12. Repeat steps 10-11 with the white chocolate melts. 13. Lightly sprinkle the red, white and blue star sprinkles on top of each cookie. Speaking of easy, below is the easy-peasy printable version of this recipe! be sure to check back for several more fun patriotic recipes to perfect your Memorial Day and/or Fourth of July celebration! These mouth-watering Red, White and Blue Patriotic Star Sugar Cookies are perfect for Memorial Day, the 4th of July and more! Add the eggs and butter to a medium mixing bowl. Whisk to blend well. In a large mixing bowl, add the flour, sugar and baking powder. Stir until mixed. Add the vanilla and stir well. Pour into the bowl with the dry ingredients. Blend until fully incorporated. Roll the dough out on a floured surface. You can make the cookies as thick or as thin as you want. Using a star cookie cutter, cut out 18 star shapes and place them on the cookie sheets. Sprinkle white sanding sugar crystals (optional) on top of each cookie. Bake for 10-12 minutes. Do not let the cookies brown. Cool on the cookie sheets for 5 minutes and then transfer to wire racks to finish cooling. While still warm, place a red chocolate melt in the middle of each cookie. In a small microwave safe bowl, melt the blue chocolate candies for 45 seconds. Stir until melted. (Depending on your microwave, you may have to microwave in 8 second additional intervals until melted). With a spoon, lightly drizzle the melted blue chocolate on top of each cookie. Repeat steps 10-11 with the white chocolate melts. Lightly sprinkle the red, white and blue star sprinkles on top of each cookie.